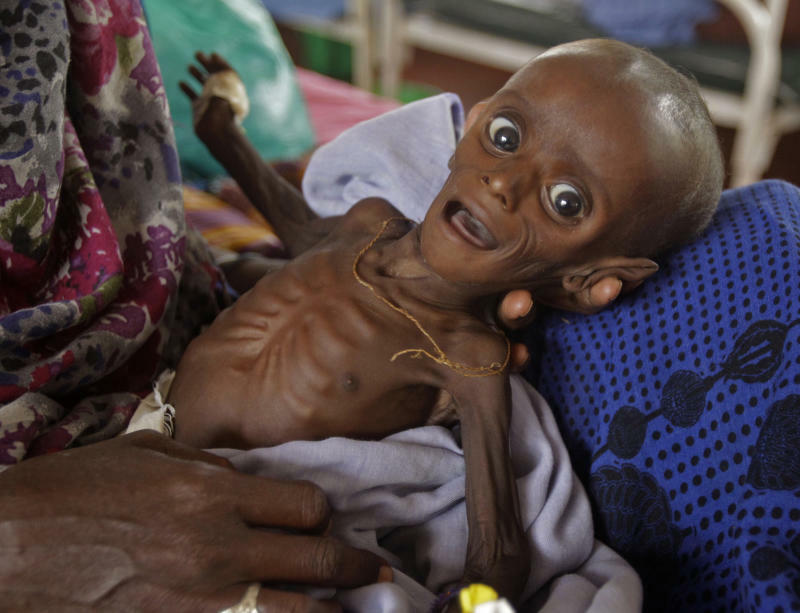 NAIROBI, Kenya (AP) -- Global warming may have contributed to low rain levels in Somalia in 2011 where tens of thousands died in a famine, research by British climate scientists suggests. Scientists with Britain's weather service studied weather patterns in East Africa in 2010 and 2011 and found that yearly precipitation known as the short rains failed in late 2010 because of the natural effects of the weather pattern La Nina. But the lack of the long rains in early 2011 was an effect of "the systematic warming due to influence on greenhouse gas concentrations," said Peter Stott of Britain's Met Office, speaking to The Associated Press in a phone interview. The British government estimates that between 50,000 and 100,000 people died from the famine. But the new research doesn't mean global warming directly caused those deaths. Ethiopia and Kenya were also affected by the lack of rains in 2011, but aid agencies were able to work more easily in those countries than in war-ravaged Somalia, where the al-Qaida-linked Islamic extremist group al-Shabab refused to allow food aid into the wide areas under its control. The peer reviewed study will appear in Geophysical Research Letters, a journal of the American Geophysical Union. Senait Gebregziabher, the Somalia country director for the aid group Oxfam, said climate change is increasing humanitarian needs. "In the coming decades, unless urgent action is taken to slash greenhouse gas emissions, temperatures in East Africa will continue to rise and rainfall patterns will change. This will create major problems for food production and availability," Gebregziabher said. Stott said that the evidence is "very strong" that the planet is warming due to an increase in greenhouse gases. He noted that the study indicates that both natural causes — La Nina and the short rains — and man-made causes contributed to Somalia's drought. The Met Office's computer modeling study found that between 24 percent and 99 percent of the cause of the failure of the 2011 rains can be attributed to the presence of man-made greenhouse gases, Stott said. Ahmed Awale works for the non-profit group Candlelight, which is dedicated to improving conservation and the environment. He believes Somalia's climate has been changing for many decades, with rainfall patterns becoming more erratic. "If you miss one of the two rainy seasons we have a very severe drought. The other indicator is that there is a rise in temperature," he said, adding later: "This all negatively impacts the livelihood of the people. Most of Somalis depend mostly on pastoral production."